Are You Suffering with Ear Pain, Pressure or Dulled Hearing? 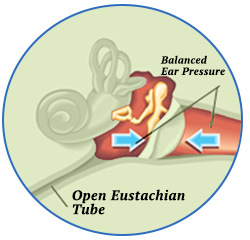 The Eustachian tube is responsible for equalizing pressure in the middle ear, and also allows mucus to drain. Normally, the Eustachian tube is collapsed, but opens when swallowing. Swelling in the Eustachian tube (or the membranes surrounding its opening) may result from upper respiratory tract infections or allergies. This can lead to fluid becoming trapped in the ear, leading to bacterial growth, and ear infections. this condition becomes persistent, decongestants alone may not be enough. 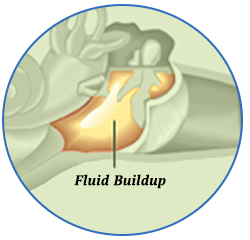 Previously, Eustachian Tube Dysfunction has been treated with medications or with an ear tube operation. However, these procedures do not address the underlying problem and may lead patients to develop chronic symptoms and long-term complications. 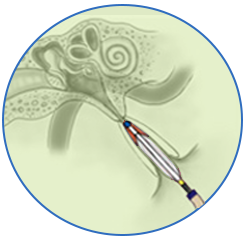 When medical treatment has failed to provide lasting relief for ear pain, swelling, and pressure related to Eustachian Tube Dysfunction, you may be a candidate for the AERA™ Eustachian Tube Dilation procedure. Patients can permanently cure ear infection pain by taking just one day for this convenient in-office treatment. First, a catheter is used to insert a small balloon into the Eustachian tube. The balloon is inflated gently to expand the Eustachian tube. The balloon is then deflated, and the catheter is removed, restoring proper Eustachian tube function. AERA™ is the first FDA-approved device to safely and effectively treat Eustachian Tube Dysfunction at the source. This treatment has been clinically-proven to reduce the recurrence of chronic ear infections. Imagine living free of ear pain, blockage, clogging, ringing, and hearing loss. The minimally-invasive AERA™ procedure is performed in the offices of Ear, Nose, Throat & Sinus Center of Orlando by our team of ENT professionals. During the procedure, a small balloon is inserted into the Eustachian tube using a catheter. The flexible device allows the physician precise access and positioning, minimizing trauma to the delicate surrounding areas. The balloon is then dilated, expanding the Eustachian tube, allowing for normal function to be restored, and providing immediate relief. Best of all, the AERA™ procedure requires no cutting, with minimal pain involved, and quick recovery time. Get long-lasting relief and enjoy a higher quality of life free of ear infection pain and swelling. A member of our friendly, knowledgeable staff will be happy to answer your questions. physician for a full discussion of risks and benefits to determine whether this procedure is right for you.